In 2015 I decided to try a new recording technique. Before this disc I had always tried to make recordings that sounded pretty much like my live sound but I was never happy with the sound. 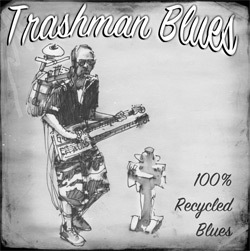 For the Traashman Blues CD I just tried to record the songs that I was doing at the time but I just tried to make the songs sound good and and didn't use the one man band drums. I'm much happier with this recording and all the reviews have been very positive. 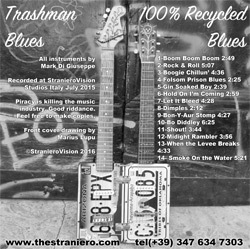 The CD is mostly blues with a little rock and country thrown in. I'm the only musician and play guitar, bass, drums, harmonica, trumpet, accordion, organ, stranierofono and Jew's harps. The entire CD is here in MP3 format if you want to download it, I give it freely if you wish to donate something to my virtual hat (could I be the first street artist with a virtual hat for donations?) or buy a copy of the CD click here. If you click on the photo, you can even have a printable CD cover. 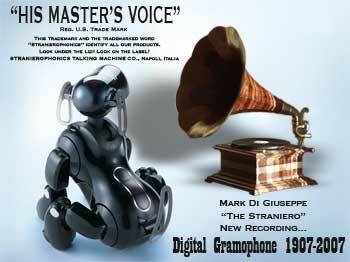 In 2007 I recorded "Digital Gramophone", a CD of 32 short songs trying to keep the sound basically to what I was doing live at the time which was a New Orleans-ish jazz traditional sound for the most part. It is a fair representation of what I sound like sometimes. It is NOT a fair representation of what I sound like always! Sometimes I have a much more electric rock/reggae kind of sound. My daughter, Gaia, is featured on tracks 19 & 32 and does a small cameo on track 23.